Ah, the crack of the bat, the smell of hot dogs in the air, and a nice cold one to get things started. This Sunday, Easter Sunday, in fact, marks the start of the 2010 Major League Baseball season and who else but the Yankees and Red Sox are batting leadoff. That’s right; button down the hatches because the World Series-defending Bronx Bombers are invading Fenway Park this weekend to see if they can keep the Fenway Faithful quiet with the likes of Jeter, Cano, Teixeira and A-Rod carrying some heavy lumber into the comfy confines of Red Sox Nation. The Yankees, my least favorite team, are coming off their 27th WS championship season and sporting a few new faces in their lineup. First we have Nick Johnson, a Bronx oldie really, who’s returning to DH for New York, along with Curtis Granderson, the speedy center fielder who couldn’t bolt fast enough from the Tigers to don his new pinstripes. Both of these acquisitions are good, but it will be Granderson’s hustle and defense that’s make the difference in games, and not Johnson’s career .273 bat. The other “new” acquisition, like Johnson, is a former Yankee who’s making a return to the Bronx with the hopes of spelling a better ending this time around. Javier Vazquez, a steady right-hander who posted a 15-10 mark last season with the Braves, was part of the Yankees’ 2004 team which recorded the greatest postseason flop in history by dropping four straight to the eventual WS Champion Red Sox in the ALCS (after leading three games to none). The Yankees are strong, no doubt about it. They watched 2009 WS MVP Hideki Matsui sign with the Angels in the offseason and shut the door on departing left fielder Johnny Damon, who landed with the Tigers. Nonetheless, they have the Big Four returning in Captain Jeter, Jorge Posada, Andy Pettitte and Mariano Rivera and seem well poised to contend for ring No. 28. Most betters would put their money on the Yankees coming out of the gate strong and staying atop the AL East for much of the season. But I’m not like most betters. I’m a card-carrying member of Red Sox Nation who has followed the Bosox since I was a kid. My dad was a born-and-bred Bostonian who brainwashed his kids early to follow the Red Sox through thick and thin. And trust me, up until the ’04 season, it was mostly thin. Despite watching guys like Yaz, Rice, Freddie Lynn and Carlton Fisk so some pretty incredible things, they never won a ring. And you’ll notice I left out two significant names – Boggs and Clemens – for obvious reasons. That’s why I’m looking forward to guys like Dustin Pedroia, Kevin Youkilis, J.D. Drew and Victor Martinez packing a few wallops themselves this season, preferably setting the stage with memorable season debuts on Sunday. The Red Sox picked up a few veterans during the offseason themselves, which should make the here-and-now more important than the hereafter. Newly acquired vets Marco Scutaro (34), Mike Cameron (37) and Adrian Beltre (turns 31 next Wednesday) aren’t the youngest trio in the bigs, but they could provide the defense and stability the Sox are looking for. Their gloves alone should win a few ball games this season for Beantown, not to mention what they can provide at the plate. No comparison between the Yankees and Red Sox would be complete without mentioning the greatest Yankee Killer of them all, David Ortiz. “Big Papi” is 34 and has lost some oomph off his bat, but he still accounted for 28 dingers and 99 RBI last season. That’s why he’ll see some action in this three-game showdown with Jeter and company, although he probably won’t face CC Sabathia on Sunday. Truth be told, over the past two seasons, Ortiz has batted just .216 against lefties and CC is all about defining “southpaw.” He was 19-8 for the Yanks in the regular-season last year and pretty much unhittable in the playoffs. 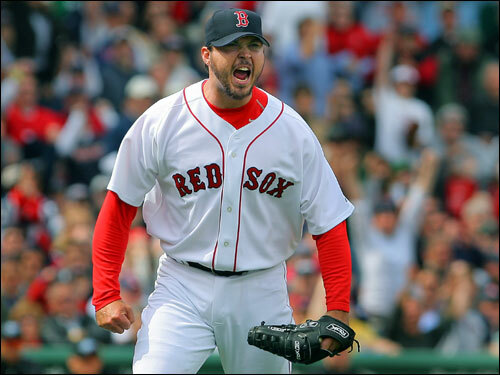 That’s why Red Sox right-hander Josh Beckett needs to be “on” Sunday. He can’t give up a pair of deep blasts to the likes of Tex and A-Rod in the early going and put his team behind. He needs to line ‘em up and knock ‘em down. Once again, the stage is set for an exciting 2010 baseball season and what better way to open it than with a thrilling clash featuring the greatest rivalry in sports. Like the home-plate umpire says: “Play Ball.” Can’t wait, baby!